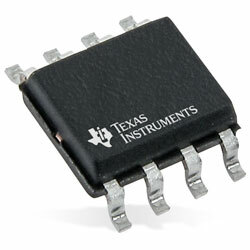 Texas Instruments OPA2356-EP high-speed, voltage-feedback CMOS operational amplifiers are created for video and other applications necessitating a broad bandwidth. The device provides options such as a differential gain of 0.02%, a differential phase of 0.05-degree, and a quiescent current of 8.3mA per channel. The device offers unity-gain stability and can drive large output currents. The device is optimised for operation on single or dual supplies as low as 2.5V (±1.25V), and up to 5.5V (±2.75V). The common-mode input range for the device increases 100mV below ground and up to 1.5V from V+. The device sustains a broad dynamic range with the output swing within 100mV of the rails. The device is offered in dual (VSSOP-8) versions, that highlight independent circuitry for lowest crosstalk and freedom from an interaction. The devices are specified over the extended –55C to 125C range. Typical applications cover video processing, optical networking, tunable lasers, photodiode transimpedance amplifiers, active filters, high-speed integrators, ADC input buffers, DAC output amplifiers, and communications.